Good review, Mike. I often think that I need to get me some Scorpions listening. I have one album of theirs that a friend threw my way (Blackout), but I haven’t yet listened to it. Though I loved Wind of Change when I was younger. Blackout is wonderful, so’s Lovedrive. I’ll get this sucker on this week’s playlist! Blackout is a great little LP. To me though, I think you have to go back to the 70’s with this band, to the stuff with Uli Roth, before they went too mainstream with their sound. That’s some interesting music! I’m prioritising giving Blackout a listen this week. I shall report back and if I like that I’ll check out Mr 1537’s recommendation in due course. What would you suggest for further listening? Nice one Mike. I know nothing at all about this period Scorpions – I’d written them off as naff by then. I have to say though I really liked Alien Nation, that one rocked – maybe I need to pay closer attention. Hit and miss, man. 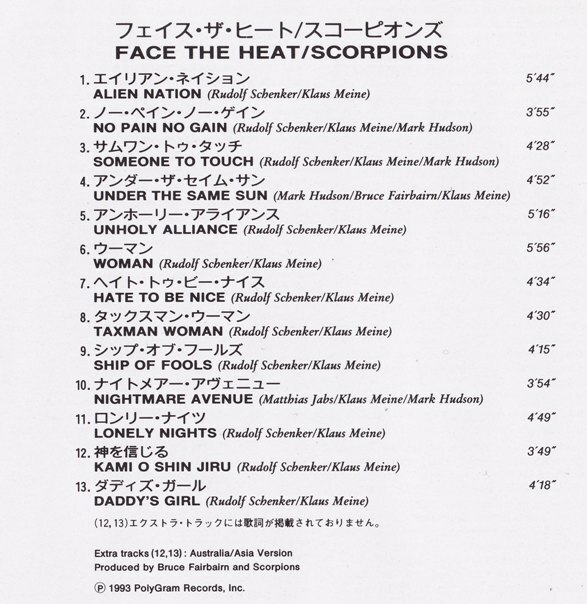 I could make a really good mix CD from these “lost period” Scorpions albums. They couldn’t though, because they would overload it with ballads. Your bang on with the review Mikey! I can’t even recall side 2 at all I filed this one away pretty quick. This one and Live Bites are the last two Scorps I bought…so it’s been awhile as for me it’s Blackout and World Wide Live are my favs! Crazy World had its moments …..
Yeah Live Bites was the last one where I “cared”. They really bit the dust on Eye II Eye. I’m not planning to do it soon, but I’m going to have to try to listen to it. Quality did drop really low in the 1990s, after Crazy World. But it has picked back up. The last several albums are quite good. I haven’t thought their recent stuff was that good. Comeblack was disappointing…Unbreakable was OK but too generic and blase…Humanity Hour One, I know some people like it but I think it was a massive mistake. Savage Amusement is the last one I really loved.